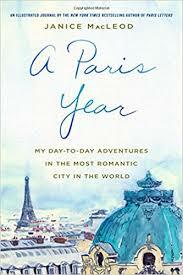 After the first 10 pages or so of A Paris Year I pretty much decided that I wasn't going to post about this book. The book at that point felt a bit kitsch. But as I went on the book drew me in. The author is also the illustrator and photographer – the book is very pretty indeed. But it also ends up catching the essence of Paris without being too cliché'd. The book has a lot of sly wit – the pages on Versailles had me in stitches. There has been some criticism of some typo's and grammatical errors but that didn't worry me – the typeface and approach is meant to be like a personal journal – and whose personal journal is perfect? I'm glad you stuck through it! Sometimes it is worth sticking with it. I would have liked to have got this now because I am in the middle of planning a short Paris trip next month.